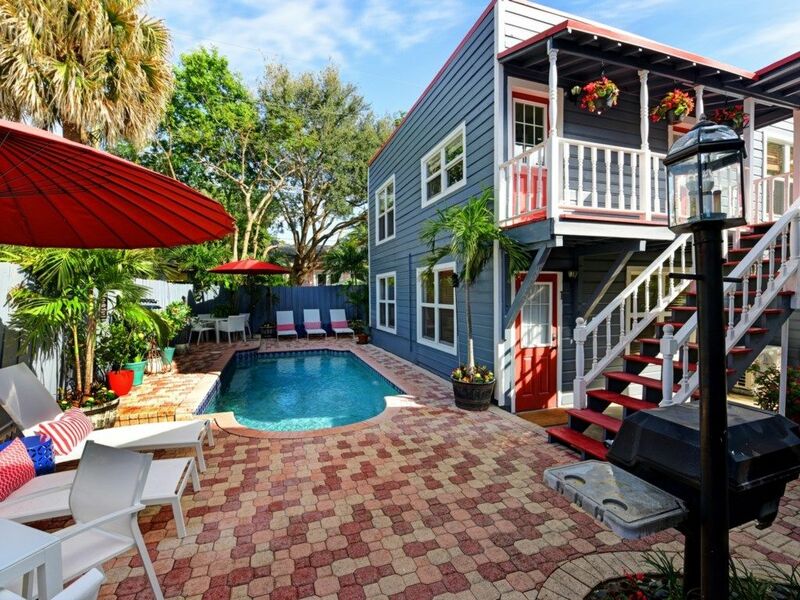 This charming fully furnished and equipped one bedroom / 1 bathroom vacation apartment is located on the property of a historic home in the Grandview Heights Historic District within the West Palm Beach Arts & Entertainment District adjacent to downtown. Walk to restaurants, shops, cafes, night clubs, musems and the Kravis Center for the Performing Arts. Conch Shell Cottage Unit 1 is located on the ground floor with an outside private entrance, private patio and views towards the heated swimming pool. The bedrooom is furnished with a king size bed and the bathroom has been newly renovated. The living room, which has been completely newly furnished as of Winter 2016, also features a sofa bed. There is a shared washer and dryer (complimentary), grill area, lounge chairs and an outdoor dining space by the pool. Conch Shell Cottage Unit 1 is ideal for single or double occupancy, but with the sofa bed, up to 4 people can overnight in this apartment.